Jiro Ono, of Ginza’s Sukibayashi Jiro in Tokyo, may have made headlines and silver screens the world over with his blockbuster documentary Jiro Dreams of Sushi, but less is known about chef Masahiro Yoshitake, who quietly ran his own award-winning sushi bar in the same district. 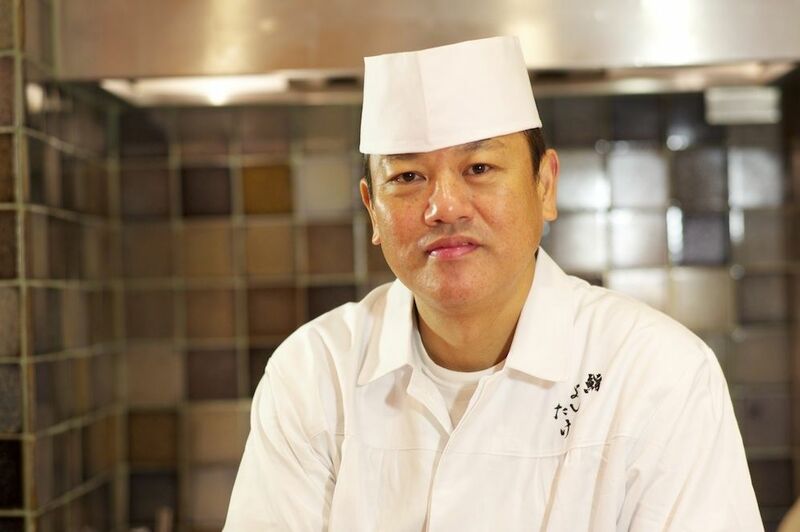 Sushi fanatics, however, speak glowingly of Yoshitake’s unwavering skill and generosity; his creations are from the classic Edomae sushi tradition, with simplicity at its heart. Now, local diners who have travelled to Yoshitake’s Tokyo restaurant will be able to experience the same quality in their own backyards. In an unprecedented move, chef Yoshitake has decided to open his second restaurant in Hong Kong, choosing Sheung Wan’s Mercer Hotel as his base. The chef will still maintain his restaurant in Ginza, but aims to be in Hong Kong a lot of the time from now on. When asked why he chose the city over other cosmopolitan culinary centres such as New York, London or Paris, he praises Hong Kong’s collective palate. Apart from the obvious proximity allowing the chef to still import the best fish daily from Tsukiji Market, Hong Kong, to him, is a city of gourmands. On the day we visited, the restaurant was a quiet oasis amidst the chaos of still-ongoing renovations; like his original sushi bar, the décor is bluntly plain and understated. The only accents of colour come by way of forest-green fabric curtains and, in a more metaphorical sense, the boyish banter between chef Yoshitake and his sous chef and protégée, chef Yoshiharu “Kaki” Kakinuma. They make silly puns (calling a golden eye snapper “the James Bond fish” and imperial prawns as “car shrimp”, as the name kuruma-ebi literally means just that). Only eight seats are available at the pale blond hinoki wood sushi counter, allowing diners to experience complete and utter dedication from Yoshitake and his team, and to interact more fully with the chefs. Set menus start from around HK$2,500 per person and go up to around HK$4,500 per person. In the video above, chef Yoshitake speaks about his sushi philosophy, why the restaurant has a drinks list heavy on French bottles as well as Japanese koshu wine, and why simple is best.